Experts believe the increase is temporary and will sink as disagreements with the West continue over the fate of Ukraine. 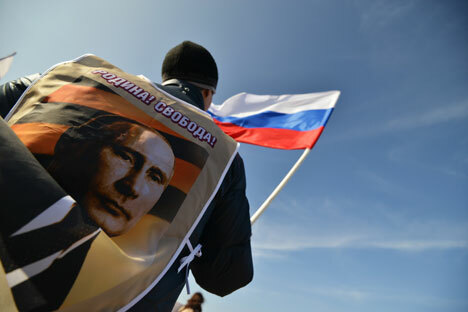 President Vladimir Putin’s popularity among Russians increased 5 percent ahead of the referendum in Crimea, according to sociologists from the Public Opinion Foundation (FOM). However, experts believe this increase is temporary and will sink as disagreements with the West continue over the fate of Ukraine. In poll conducted by FOM the week of March 10, when asked “who would you vote for if presidential elections were held next Sunday,” 53 percent of respondents replied “Vladimir Putin.” The week before, only 48 percent of respondents gave the same response to an identical question. Political scientist Dmitry Abzalov ties the increase in ratings to two factors: the Sochi Winter Olympics and Paralympics and the referendum in Crimea. According to Abzalov, Putin’s ratings are tied to changes in foreign policy because Russian domestic politics are calm at the moment. “If the internal situation is stable and there are no serious fluctuations, then the main factor [affecting the ratings] will be foreign policy,” Abzalov said. “In the Russian Federation, the president is associated with foreign policy; it is considered his personal responsibility. Defeats, failures or successes in foreign policy influence the ratings.” Abzalov has predicted that Putin’s ratings will hold strong through May, although subsequently the ratings may drop. “His position on Ukraine is tough and quite understandable to most Russians. The picture that we saw at Maidan over the last few weeks evokes negative emotions among the majority. No one wants to find out who stands there with what goals. “Putin’s position, that the power in Kiev is illegitimate, calls forth an analogous reaction in the majority [of Russians]. Putin’s decision on Crimea is an important factor. The situation there is critical, and there was a moment when it was not completely clear how Russia would respond to the Crimeans’ call for unification. Putin’s decisiveness and the request to the Federation Council concerning the use of troops in extreme situations demonstrated his willingness to follow through. This has greatly influenced Putin’s ratings,” Polyakov said. Like Abzalov, Polyakov thinks that Putin’s ratings will fall, possibly to their 2012 levels or even lower as difficult decisions are made about Crimea.